The A12 Gas Transmitter is a 2-wire unit that can handle 28 different gases and uses smart sensing modules. The UniSens is designed for ambient gas monitoring in the industrial environment. Replacment sensors can still be purchased. The A12 2-wire UniSens toxic gas transmitter is specifically designed for ambient gas detection in a variety of industrial environments: gas storage area, gas compressor rooms, process piping galleries, rail car siding, analyzer shacks, gas cabinets, and chemical process areas. The A12 UniSens unit combines universal electronics, bench calibration capability, automatic sensor verification, fault detection and alarming, and smart sensor technology. The transmitter can be used in many hazardous environments where gas conditions are possible because of leaks of through natural buildup. The A12 can be used with 28 different gases and the electrochemical gas sensor provide excellent response time. The companion memory assembly stores operation information and calibration constants, along with gas sensor identification, sensing module range, and software revision level. Complete sensing modules are housed in a piece that snaps-in to the main A12 UniSens transmitter. Choose the gas sensor you require, or choose additional sensors here, to add to your order. 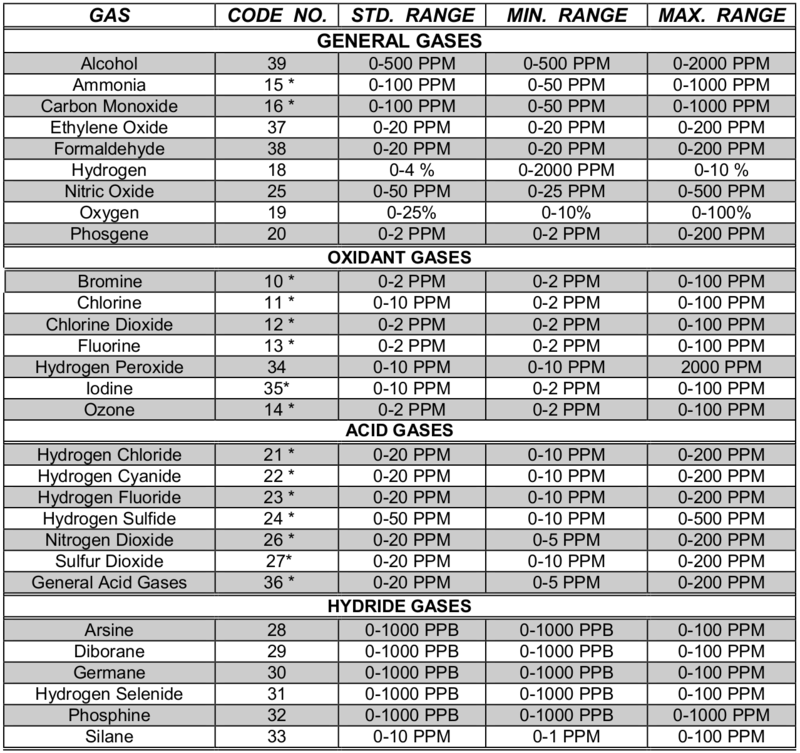 Each gas sensor is listed with a standard range however each sensor can be calibrated to custom ranges. Contact us for details on gas sensors you do not see here, or gas ranges you may require. We provide each sensor with a standard detection range. However, for specific applications each sensor can be calibrated to custom ranges. See list below for min, and max range options for each sensor, along with standard range. Please contact us with any questions on what sensor might be right for you, or if other sensors are available for your application. * Indicates that Auto-Test is available for standard ranges and lower. The A12 can be purchased with an auto-test generator to verify the sensor is working correctly. The generator produces a "puff" of gas when activated by the transmitter. The response of the sensor is monitored during this test to be sure that it is still responding to the gas and the ouput of the transmitteris drive below 3.7 mA if the sensor does not respond. The LCD will also indicate that there was an Auto-Test failure. This check is done automatically every 24 hours. If you want to verify any other time, it Auto-Test can be activated manually at any time by using the controls on the front of the transmitter. This is a great add-on to your A12 Gas Transmitter as it gives peace of mind that your unit is properly detecting. The A12 can also be purchased with a pipe insertion sensor (plus 10 ft of interface cable) so that the transmitter electronics may be mounted a short distance from the sensing location. The sensor can be mounted into a duct or pipe by using a special adapter. The special adapter allows for easy removal when the sensor needs to be calibrated without having to completely remove the duct. Controls Magnetic links activated externally through glass window. Non-intrusive calibration.